USA's Jack Sock and Ryan Harrison beat Belgian's Sander Gille and Joran Vliegen 5-7, 7-6 (1), 7-6 (3), 6-4 in the Curb Event Center at Belmont University in Nashville, Tennessee, April 7, 2018. Team USA’s Jack Sock and Ryan Harrison fought off a determined effort from a resilient Belgian doubles team to put the U.S. through to the Davis Cup World Group Semifinals for the first time since 2012, defeating Sander Gille and Joran Vliegen, 5-7, 7-6(1), 7-6(3), 6-4, on Saturday to clinch a 3-0 victory for the U.S. The Quarterfinal tie was held on an indoor hard court at Belmont University’s Curb Event Center in Nashville. 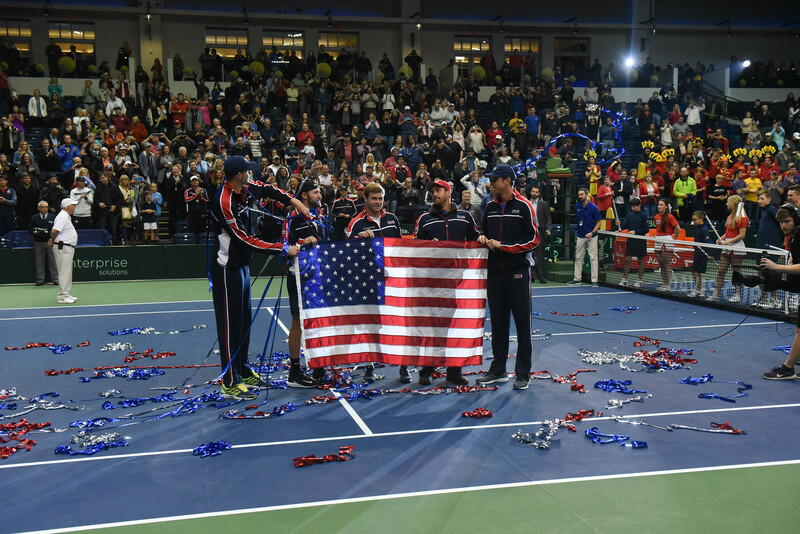 The U.S. team will travel to Croatia Sept. 14-16 for the Semifinals, marking the first time since 2012 the United States has made it to that stage of the Davis Cup competition. Beyond the tennis competition and the palpable excitement on campus all week, the Davis Cup brought visitors from around the nation and the world to Belmont, and the media coverage before and throughout the event delivered astronomical marketing value to the University. Estimates from media tracking service NewsPowerOnline indicated a potential audience of more than 1.7 billion were exposed to Belmont University through broadcast hits and website posts on Davis Cup. Meltwater Media, another tracking service, also calculated a potential reach of 1.7 billion with more than 900 million of that coming from the first week of April alone, the period when Team USA was on Belmont’s campus. A Meltwater analysis also indicated the University received an estimated $12.5 million in advertising value associated with Davis Cup coverage. Belmont University received mentions nationally and internationally, including hits in USA Today, NBC Sports, ESPN, ABC News, AP, FOX Sports, Sports Illustrated, MSN.com and Yahoo, among others. These estimates, however, only track news sources and do not include the three days of live broadcasting of the event done by the Tennis Channel in the United States, with tennis players/analysts Mark Knowles, Leif Shiras and Belmont alumnus Brian Baker leading the coverage. In addition, the U.S. vs. Belgium quarterfinal was also delivered via broadcast partners to audiences around the world, including sports fans in Austria, Germany, Switzerland, Australia, Belgium, China, Georgia, Malaysia, Portugal, Singapore, Turkey, Thailand, Cambodia, Lao, Philippines, Indonesia and Hong Kong. Media impact and ad value were far from the only benefits of hosting Davis Cup on a University campus. Belmont students and employees were also able to enjoy the competition thanks to a PepsiCo student section sponsorship and special “thank you” ticket pricing offered to faculty and staff from USTA. In total, more than 480 students reserved free Davis Cup tickets, while employees secured more than 700 seats. Sports administration and public relations students participated in a guest lecture from USTA Managing Director of Major Events (and Belmont alumnus) J. Wayne Richmond and Davis Cup Team USA Captain Jim Courier, while several students interned with the production company behind the event and the Tennis Channel. Belmont’s tennis teams perhaps had the best experience, joining Team USA to work with local youth as part of the USTA Net Generation Kids’ Clinic on Tuesday, watching practices throughout the week and attending the matches all weekend. The entire Davis Cup Team USA also participated in a unique Fan Appreciation event on Sunday afternoon, staying on court for an extra 90 minutes to ensure each and every attendee was able to secure an autograph and photo with team members John Isner, Sam Querrey, Steve Johnson, Ryan Harrison and Jack Sock as well as with Captain Jim Courier.